Oh my poor little blog, it’s been a while! The little human has continued to grow and be awesome. She’s 16 months now and runs everywhere, talks all the time and is a lot of fun. She loves dogs, books, food and of course her bunny siblings. Ned and Barbara are doing really well. They’re very close to each other these days, but also like to spend time apart. 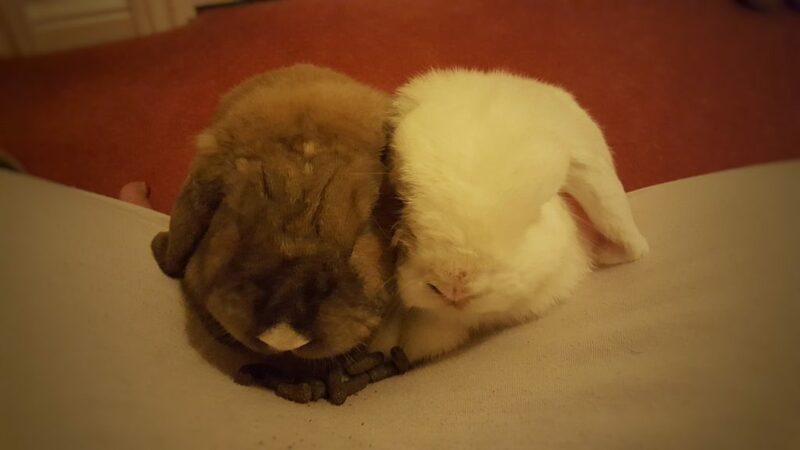 They have their set cuddle times (usually immediately after eating) but often enjoy being on the other side of the room from each other. Barbara has a limp from her arthritis these days, but they’re both quite healthy at the moment. I’m back at work, three days a week. Mixed feelings about this, of course. But it is what it is, and I still strive to do my best while I’m there. Little human goes to bed early so I’m writing again. Two things right now: one fiction and one a collaboration of sorts with the lovely Barbara Rabbit. She has a Twitter account as well, and I get a lot of enjoyment out of helping her use it! And apparently WordPress is different now and I do not like that! But I’ll get used to it. So that’s me. I have a lot of thoughts that I want to get out there these days, and fortunately I still have this poor neglected little blog in which to do it! But, going forward, I’m going to be much less personal here. Far fewer baby pictures etc. Just me, talking. And maybe Barbara. Because that bunny has opinions. It’s now been a few weeks since you left us. It’s still hard to believe. We’re doing okay, though. Thanks for asking. There’s been a few sessions of crying in the shower (me), standing outside at the grave (Daddy), searching all over the house (Ned), refusing to believe it (Barbara) and just being a bit confused (the baby). The day after you died, it snowed. It took everything I had not to go out there and start digging. I couldn’t bear the thought of you being out there, all alone and cold. You, my boy who used to cuddle up with me under a blanket when Daddy was out in the evenings. We had a cushion printed with your picture on it, and we’ve put it by the TV, where you always used to try and climb. It’s nice to see you in the living room all the time, because that’s where I spend most of my time with the baby. Your baby sister is getting so active lately. You’d love her, Gingee. She rolls all over the place now – she reminds me of you, so much, when you wanted to get somewhere that we’d blocked off. You were so determined and so is she. More than the other two, you really connected with her when she was tiny, and I’m so sorry you won’t be there to play with her now she’s more interactive. You’ve loved her since the start – I remember when you used to sit on my lap and lift your ear against my belly. Did you know she was in there? Could you hear her? Did you know you wouldn’t be here to see her grow up? Ned is doing really well. His eye is healthy – I think Barbara is taking care of it for you. He binkies a bit now again. I think he wants to show me that he’s alright. Barbara’s eye needs some work, and Daddy has had to start doing a lot more for her. I didn’t realise how much you did, Gingee. You were their vet as well as their brother, weren’t you? I make sure that I spend lots of time with them and talk about you to them. I promise that I’ll spend lots of time outside in the garden with you this spring and summer. Daddy’s already been doing that, do you know? 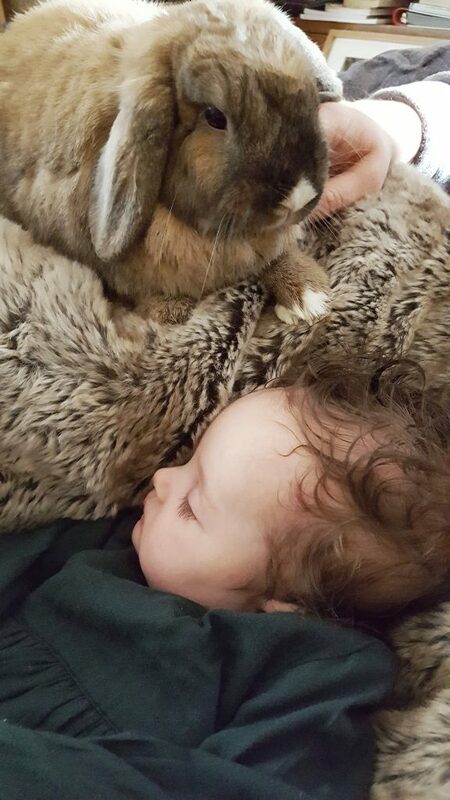 It’s Easter today, and we’ve told the baby that you’re the Easter Bunny now. I think you’d like that – although I know in reality you’d just want to eat all the chocolate yourself! Remember how you ate some of my Easter egg last year when I was feeling ill? I also remember the Easter before, when you and Ned had a little truce. It felt like an Easter miracle (a more minor one, obviously!). I have lots of questions about what happened to you. Why did you suddenly choke like that? Why couldn’t you eat after that? Did you have some sort of tumour or growth in your throat that we didn’t know about? Were you as sick as your brother all along? Is there anything we could have done? But honestly, my Gingee, if you had been sick, I’m glad we didn’t know. I’m glad we didn’t have to make any decisions about whether to do any invasive treatment that would have made you more frail, because I know you. You would have hated being weak and in pain. Better one crowded hour, Gingee. You had such a crowded hour. You did so much and were so happy. I never thought I’d have to say this. 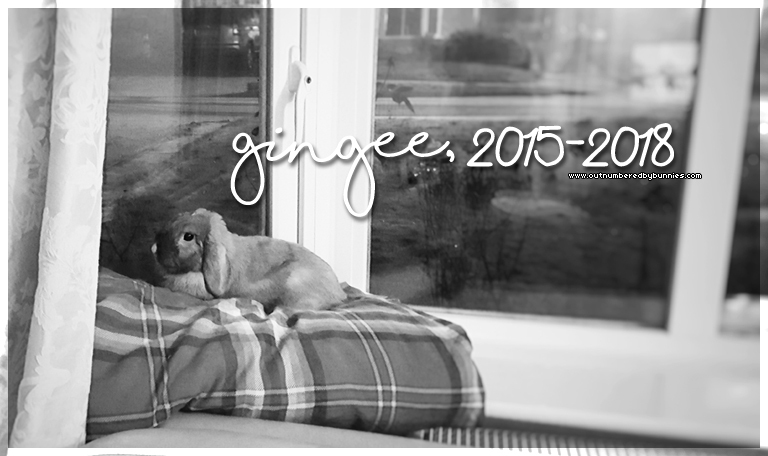 We lost our beautiful Gingee Bunny yesterday. He battled stasis a couple of weeks ago after choking on some food, but had been doing so well. He was fine and ate during the morning but passed away peacefully during the day. 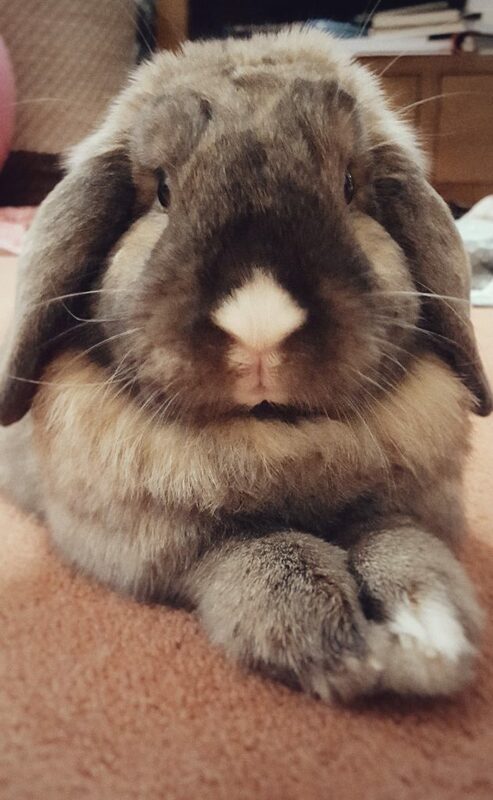 He was the most beautiful, gentle, curious and clever bunny I’ve ever had the privilege of knowing. In the two and a half years we knew him, he changed our lives indescribably. He loved my husband with all his heart, but there was space for me, the baby and Ned and Barbara as well. That he’s not going to be here any more doesn’t feel real, but we feel at peace. He lived a life full of love. If he had to go, at least he was warm and comfortable and surrounded by family. And in these last weeks, since he was ill, we’ve told him so much that we love him! 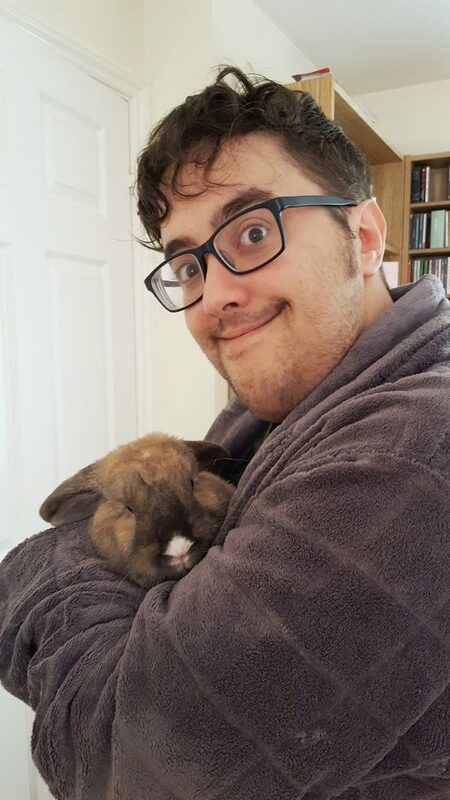 He and my husband have been able to have some lovely cuddles, and as goodbyes go, we had a lovely one that lasted several weeks. We know that our bunnies from when we were younger are probably interrogating him now about what life is like, and he’s probably got some wings to help him binky even higher than he could down here. Last night, Barbara didn’t really want to be around him. Ned groomed him one last time, and we all said goodbye, then my husband buried him in one of his old shirts, underneath a baby tree that we planted a couple of years ago when Ned was sick. This morning, Ned was sad and wanted to sniff all of Gingee’s old things – his brush, the spot on the stairs where he used to sit, his little doll. Barbara finally accepted it this morning. She was in Gingee’s favourite cardboard box when I went to give them their breakfast, and when I got her out, she looked frantically for him, before flicking her feet at me. She ate her breakfast, then went back into his box and made a low keening sound. Ned wanted to look in lots of rooms in the house to check he wasn’t there. They were littermates. Gingee was always the healthy one. We never thought he would go first. 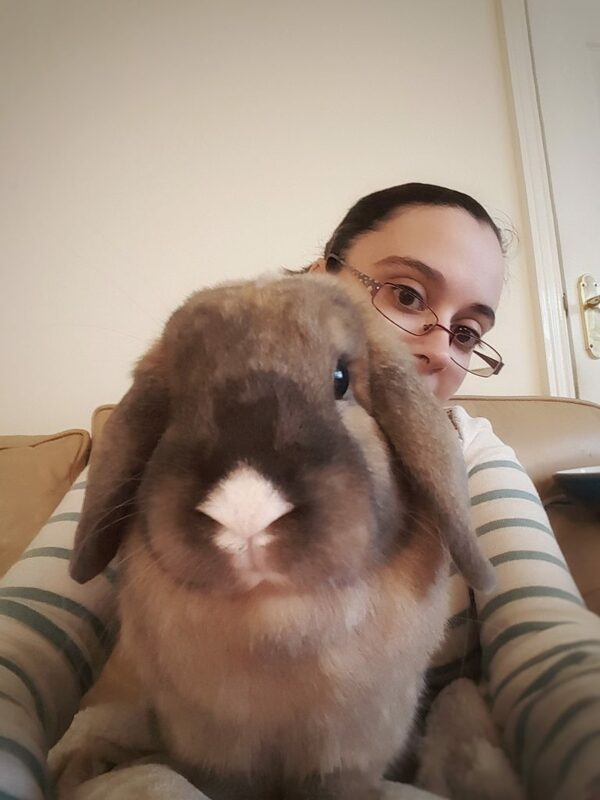 He was the best bunny (well, one of three) and I will miss him forever. Goodbye, my Gingee. Thank you for being you. Rabbit first aid kit – what’s in there? Over the years of being bunny parents, we’ve had quite a few occasions where we’ve needed our rabbit first aid kit. Ned and Barbara both have special needs, and Gingee recently had his own brush with illness. It makes life so much easier to have a little rabbit first aid kit in the house already if they get sick. Soft flannels – we use these to wash Barbara and Ned’s faces regularly. They both have malformed tear ducts which get very leaky, and if we don’t keep on top of it, the fur on their faces gets all matted. Flannels are also really useful if anyone gets injured during nail cutting and there’s any bleeding. Cornflour – putting this on anywhere that’s bleeding will help to stem it. We’ve had a few pulled out claws during trimming, and we just put the flour on there and wrap it in a towel. Critical care liquid food – we buy it from Amazon. Bowls and measuring cups that you can use to mix the critical care. It comes in a powdered form, and you’ll need to have the right amount of water to mix it up. Clean syringes – no needles, obviously! Sometimes they won’t take the critical care directly from a bowl and you’ll need to syringe it in. Baby spoons – some of ours are more eager to take from a spoon than a syringe. We’ve designated some baby spoons to be bunny spoons instead! Infacol – this is a baby gas medication, but it works really well when a bunny is feeling a bit bloated. We tend to use it as a first line of defence, and with both Ned and Barbara it’s pulled them out of stasis before we got to the vet stage. Your vet’s phone number – easily accessible. Your emergency vet’s phone number – also easily accessible. Chances are, bun will get sick or injured out of hours! A carrier – if possible, one that can be clipped into your car using the seatbelt in case you have to travel a longer distance without a second person to hold it. We tend to line the carrier with hay and put a toy in there. Bunny nail clippers – keep their claws quite short! Longer claws are more likely to cause injuries in other buns, and will also mean that bun walks on their heels, running the risk of sore hocks. Baby nail scissors – we use these to keep the fur on Ned and Barbara’s faces nicely trimmed. They’re also really useful for the odd occasion when sticky things get caught in fur, or if there are any matts that need trimming. And that’s mostly it! 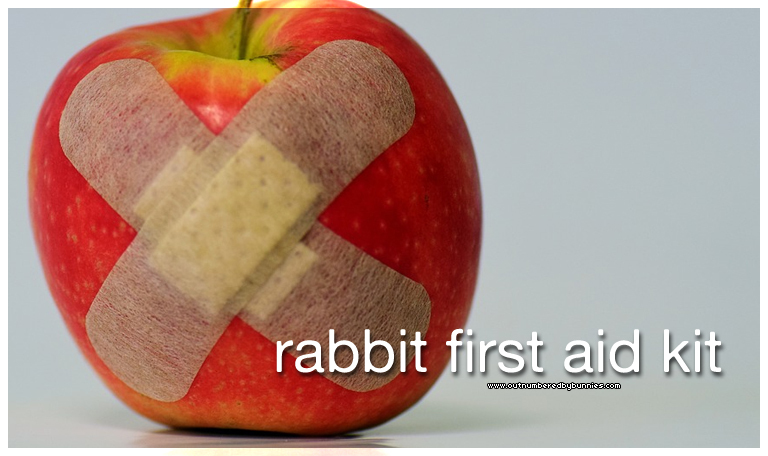 Our rabbit first aid kit has saved us all a few times before now. I hope you’ll never need it, though! This time last week, we were sitting anxiously in the vet’s waiting room with Gingee. 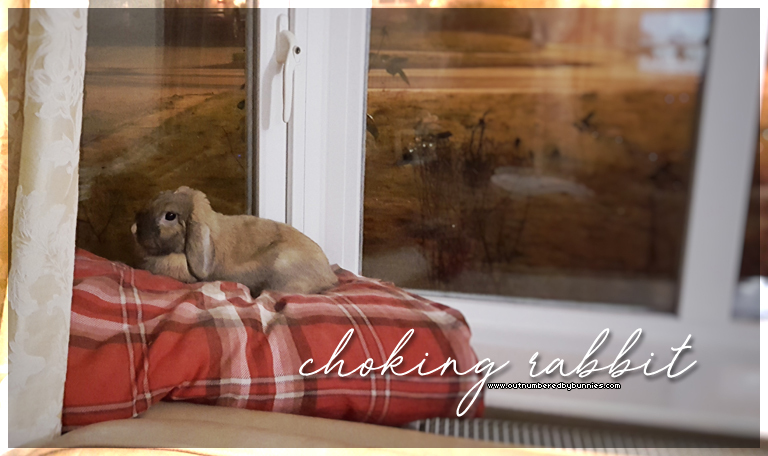 I’d never seen a choking rabbit before, and I hope that we never have to go through it again. It all started on Tuesday night, about 7pm. My husband was feeding the rabbits upstairs and I was feeding the baby downstairs. Suddenly I hear him say, “It’s okay, Gingee, you’ll be okay, let me help you.” Words you never want to hear. I detached the baby and rushed upstairs to see what was happening. A sight you never want to see. Gingee was standing frantically in a corner, his body a curve, sounding like a cat trying to get up a hairball. Our local, five-minutes-away vet had just closed for the night. The emergency vet is in the next town over. That felt too far, given he couldn’t breathe. Gingee hates travelling, and if the worst were to happen, we didn’t want him to pass away alone in his carrier in the car, terrified. Gingee and my husband have always had an amazing bond. Gingee trusts him so much, and my husband is really confident around him. He knew something had to be done, so we found this webpage. He tried the “bunny heimlich” (centrifugal swing), which got a lot of the pellet out – through his nose! The remainder came out, slowly, through thoracic compressions. He could breathe and was clearly feeling much better by then. He didn’t want to eat, though. It seemed to make sense, really – his throat would have been sore and he was clearly a bit traumatised. We gave him some nice soft greens, which he did take, just very slowly, and made up some liquid food to give him. As he’d eaten something and was breathing properly, we decided that we could wait until our local vet opened the next morning. I love our vets. They had us in within the hour. She listened to his lungs and found that he had not aspirated any food, but gave us some antibiotics just in case. He also started on a dose of loxicom to help with any pain, and ranitidine to keep his gut moving. We took him home and proceeded to spend the day trying to coax him to eat. By the following day, he still wasn’t eating much at all, so I took him in again that morning. His glucose levels weren’t too raised and he still had gut sounds, so we went back home to monitor and keep on feeding him a buffet. The baby and I went to Sainsbury’s and bought pretty much one of everything green! Within an hour or so, he started on the spinach. So relieved! It’s been just over a week now. As you can see, this little man is still with us! He doesn’t want to eat pellets, still, but his appetite for vegetables and hay is as ravenous as it ever was! We’ve pretty much been able to wean away from the liquid food now as he’s eating such a lot of veg and hay. What a stressful week it’s been, though. Have you ever had a choking rabbit? How did you help them?